Home / Family Life / Need a Doctor? Hate the Doctors Office? Need a Doctor? Hate the Doctors Office? If you have been following my blog you know that we were all very sick with the flu and head colds. It was miserable to have to take the kids to the doctor and have to wait in the sick kids waiting room only to be picking up more germs and perhaps another virus. When it came to us we really did not want to go through that again, and honestly who wants to take kids out anywhere when they are sick! Tales From A Southern Mom was recently contacted by Doctors on Demand, and this is one of those times that I think it is a perfect compliment to your regular doctor. We were able to use our cell phone and “meet” with a doctor using our camera and microphone functions. I know you are all thinking that this is a crazy thing, and at first glance it appears that way, but really when you are getting over the flu and are not sure if you have developed a sinus or ear infection what more do you need than a doctor on your phone. You are able to get prescriptions for antibiotics and most other things should you need them. You are able to talk to the doctor and give them the rundown of what has been happening and where you are now. By using your phones camera you can show them just about anything they need, and even though they cannot physically look at you in the flesh, think about how many times you have gone to the doctor for something and they did not even touch you. I also think that the physician listens, they are more focused on what you are telling them. So many of us have trusted nurse lines this is one step further and gets to the problem without you ever having to put outside clothes on! 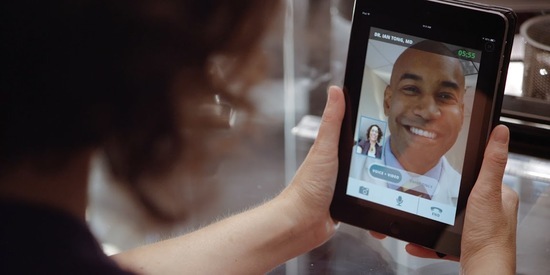 Doctor On Demand is a healthcare service that provides Video Visits with board certified physicians, psychologists, and lactation consultants via smartphones, tablets, and desktop computers. – Patients simply download the Doctor On Demand app on a smartphone or tablet or visit www.doctorondemand.com on their desktop computer, provide a list of their symptoms, and are instantly connected to a provider licensed in their state for a video visit. – Doctor On Demand is free to register (the app is free to download). You can enter your code upon registration, store it in your account, and use it at a later date. At Doctor On Demand you can see a family physician, a pediatrician, a psychologist or a lactation consultant, all from your tablet, laptop, desktop or phone. I really think this is going to be the wave of the future, and I believe that we can get good medical care this way for minor conditions, and they will let you know fast if you need to be seen at a Urgent Facility or Emergency Room. I know many new moms that would have loved to have had a lactation consultant on speed dial to consult with whenever they needed the help. You can also make an appointment with the doctors and enjoy the convience of having it ready when you are. Don’t forget to download the app or go to doctorondemand.com and enter your free code, even if you don’t need it now, you can save it for future use.